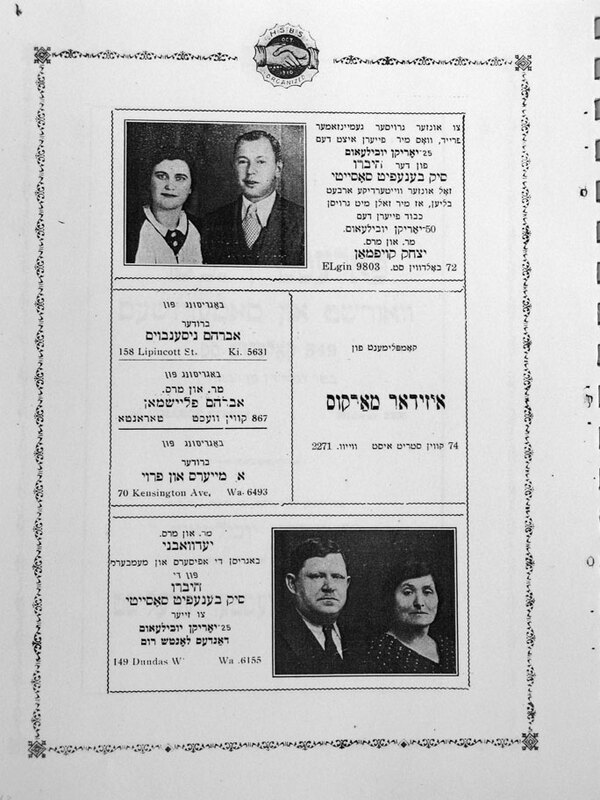 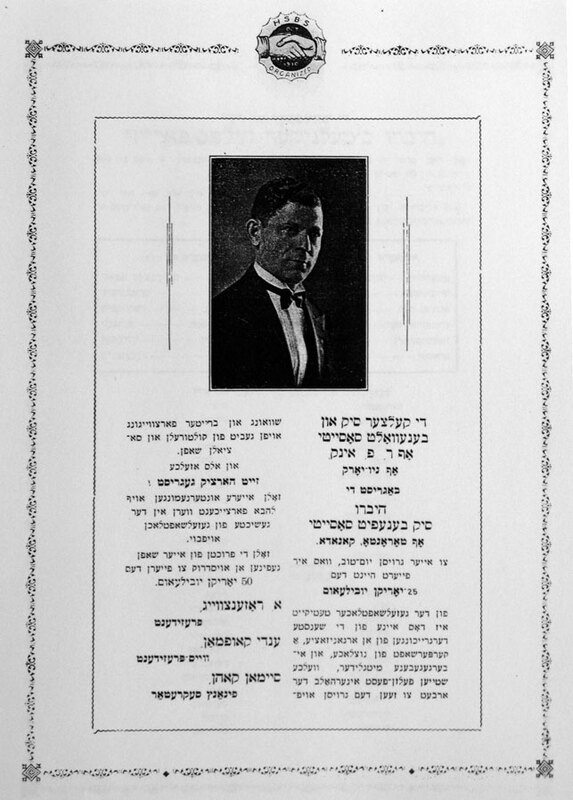 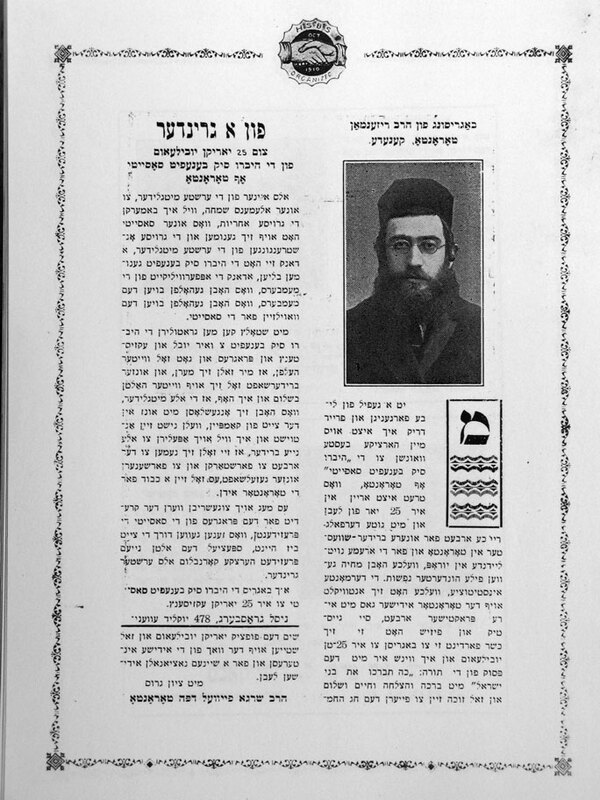 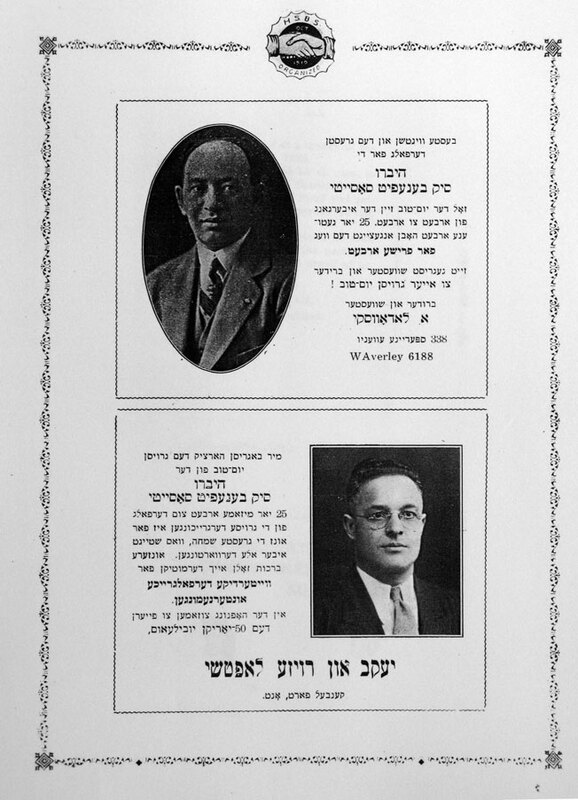 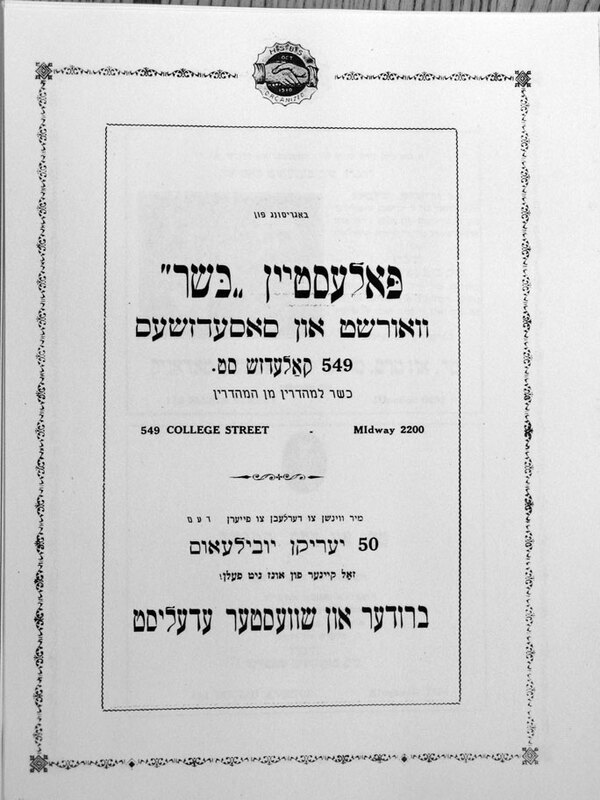 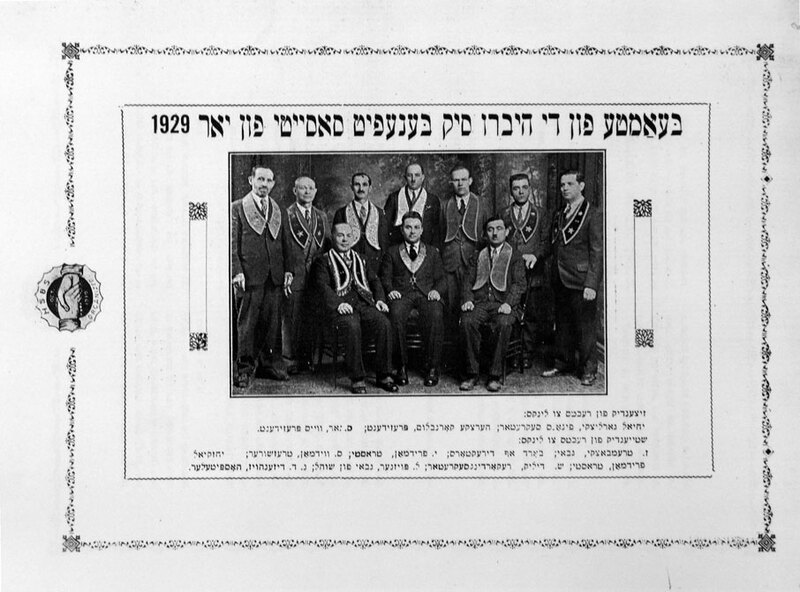 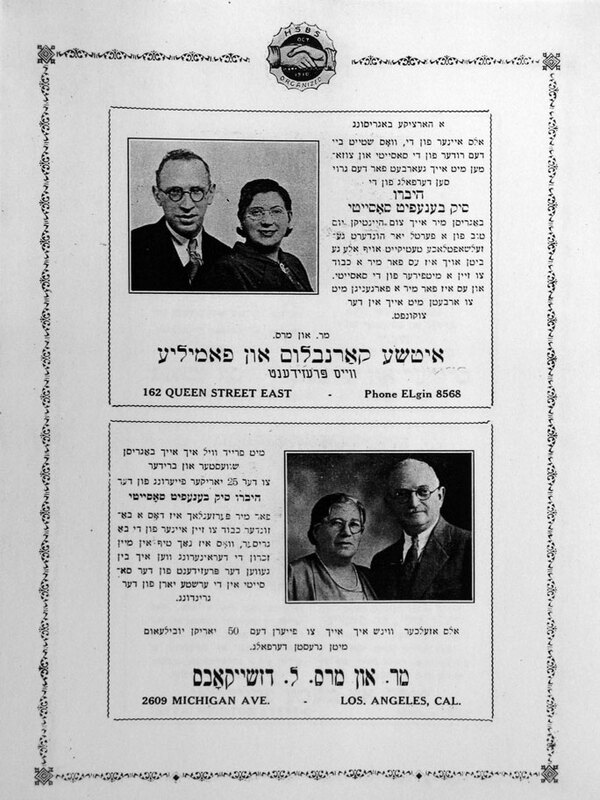 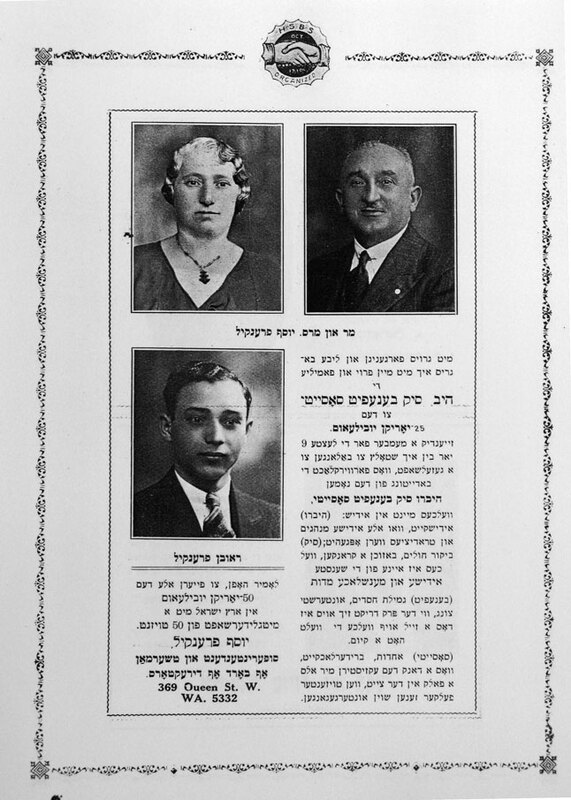 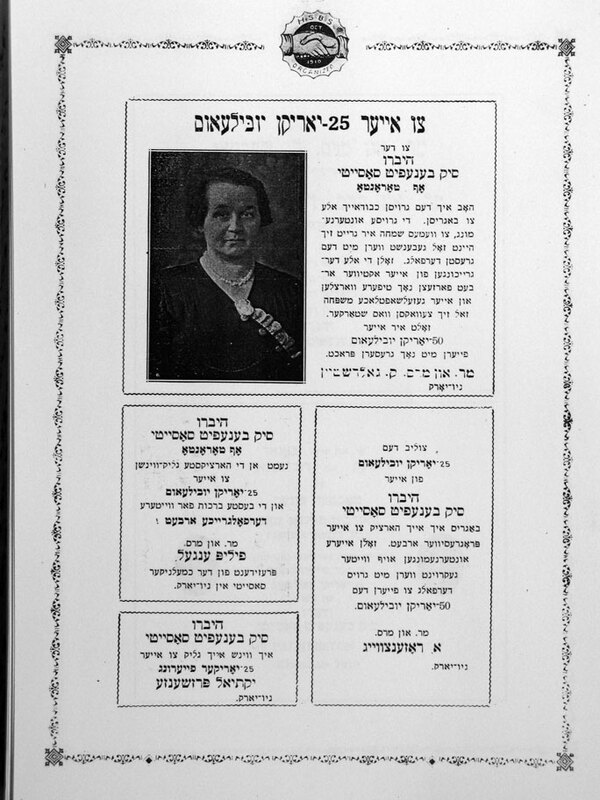 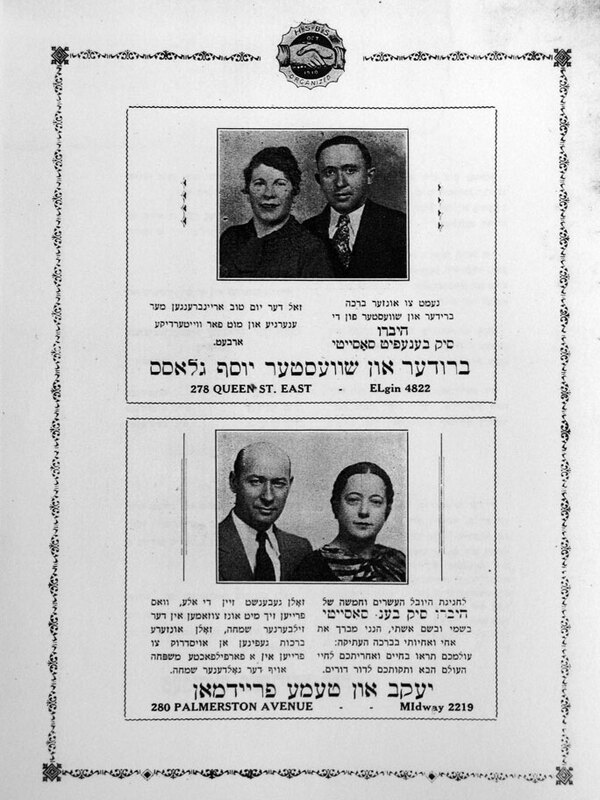 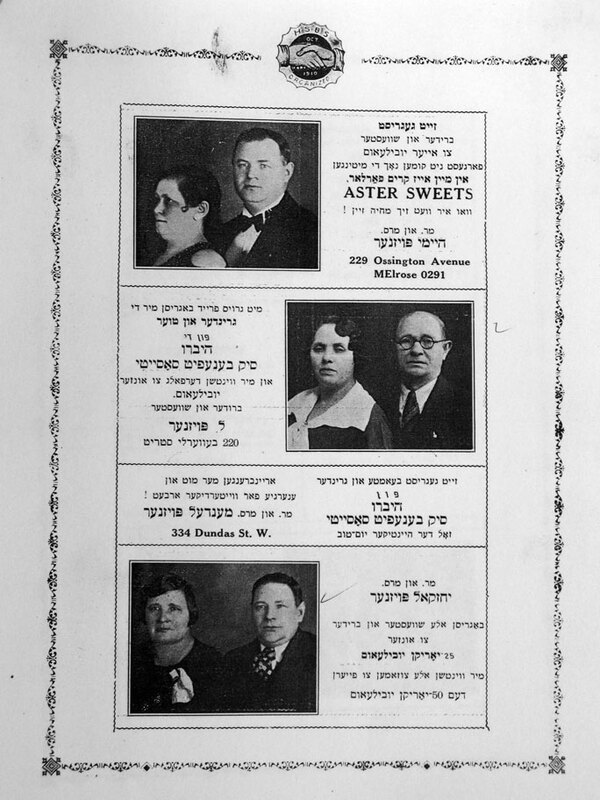 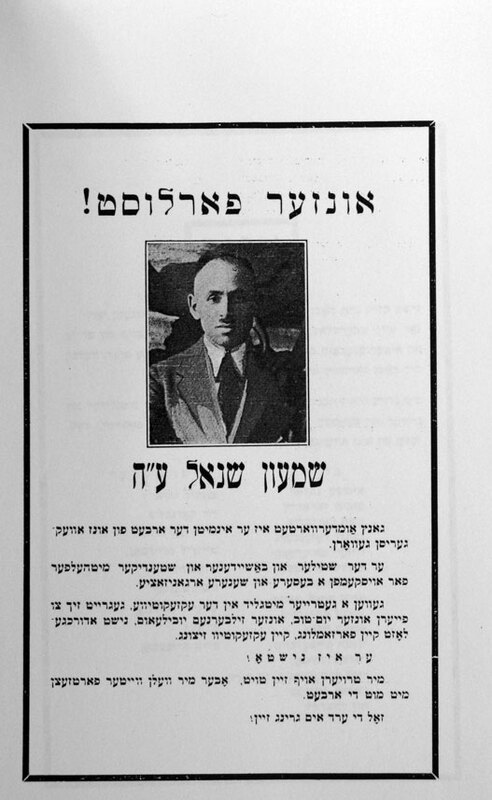 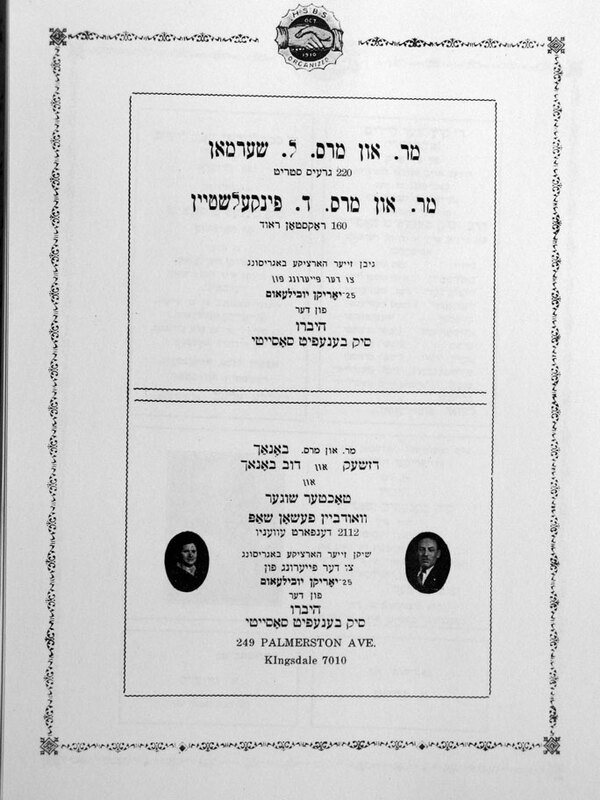 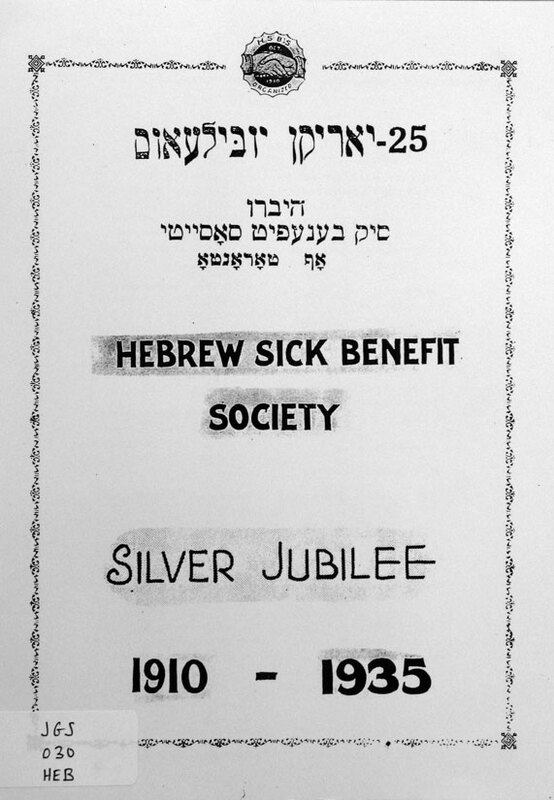 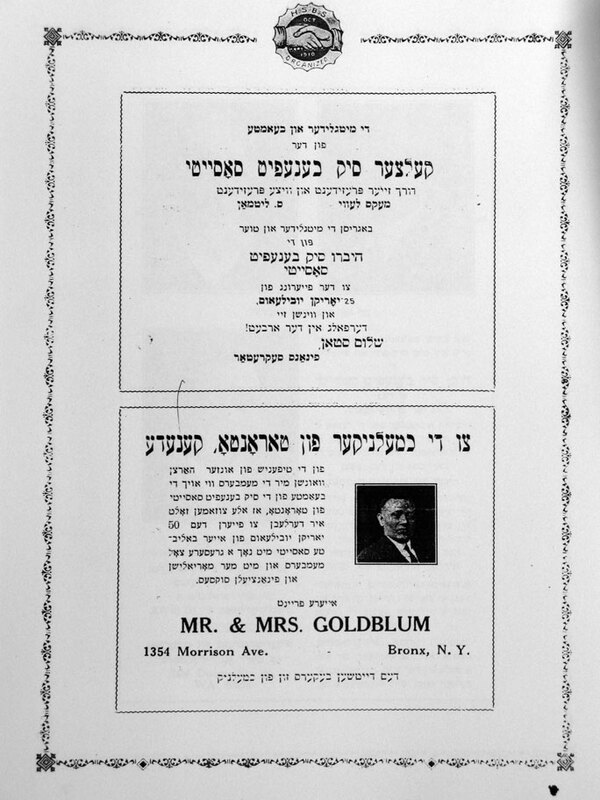 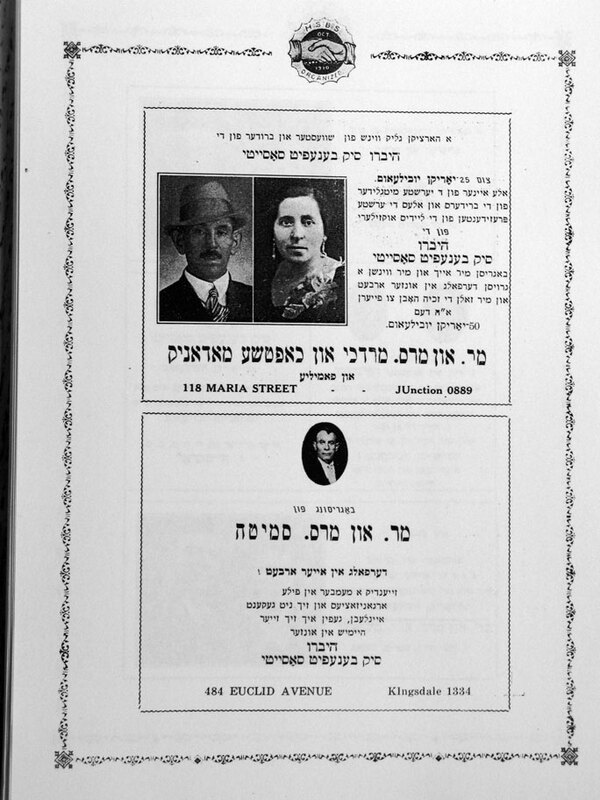 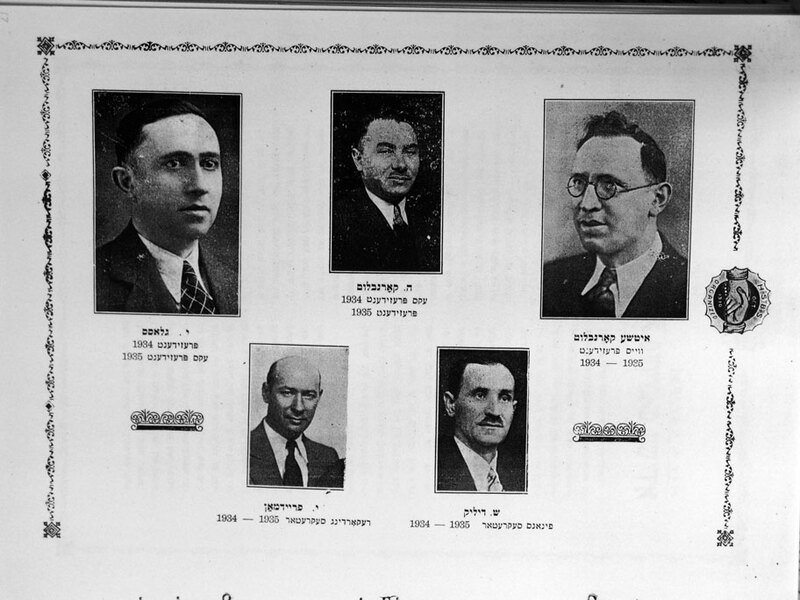 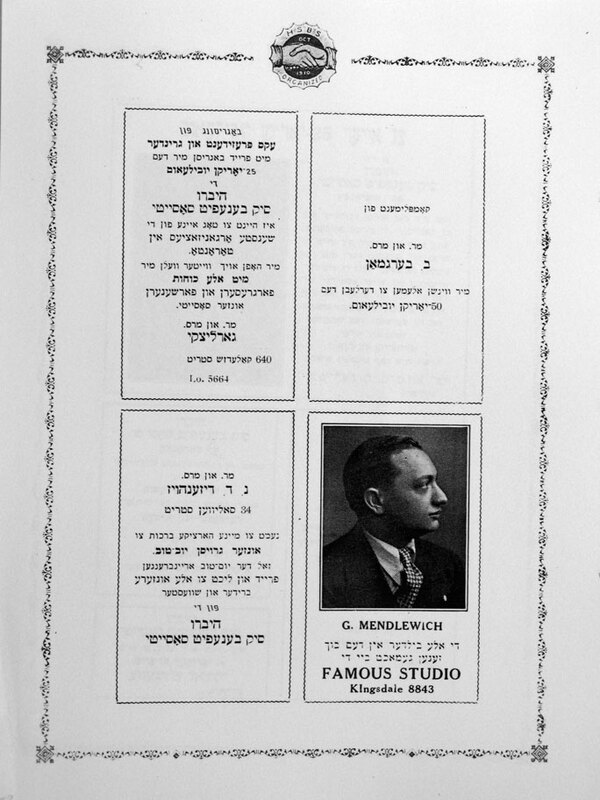 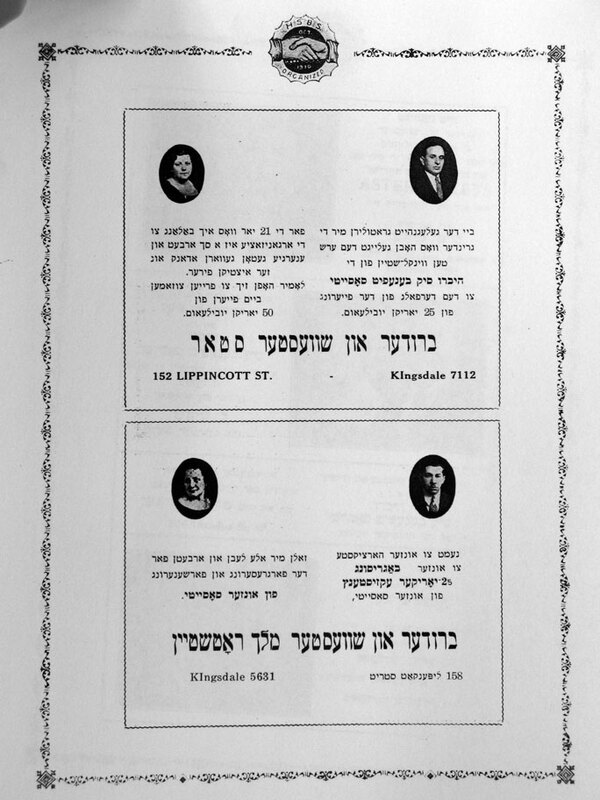 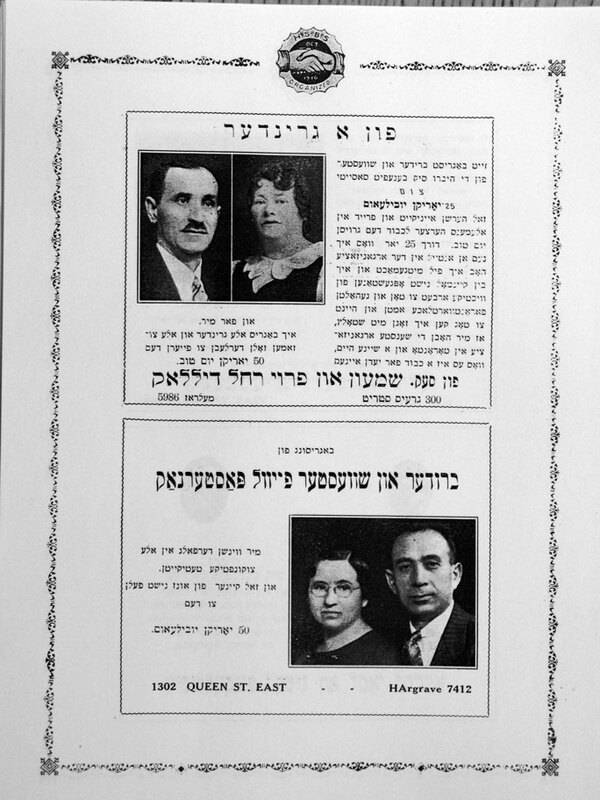 The following pages are from the souvenir booklet published by the Hebrew Sick Benefit Society of Toronto in 1935 upon the commemoration of its 35th anniversary. 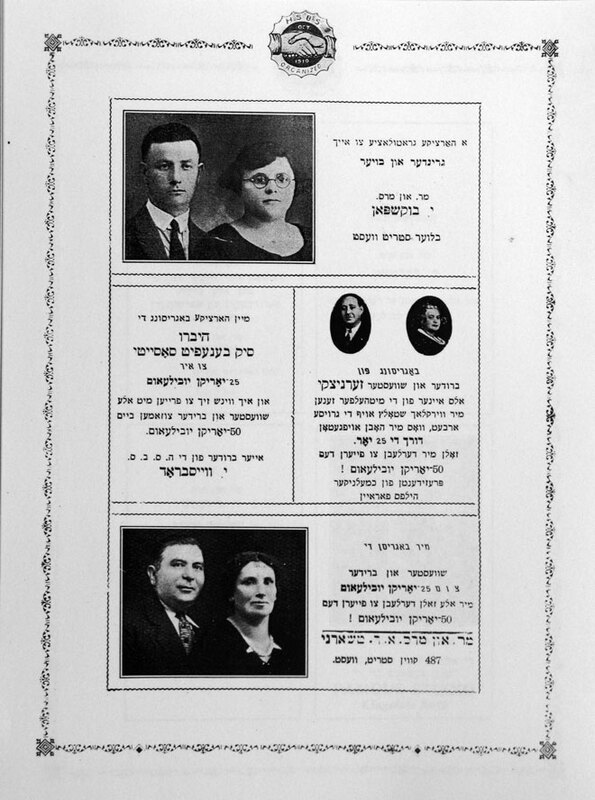 It contains many greetings, advertisements and other items from individual members, often listing family names and other details about family history. 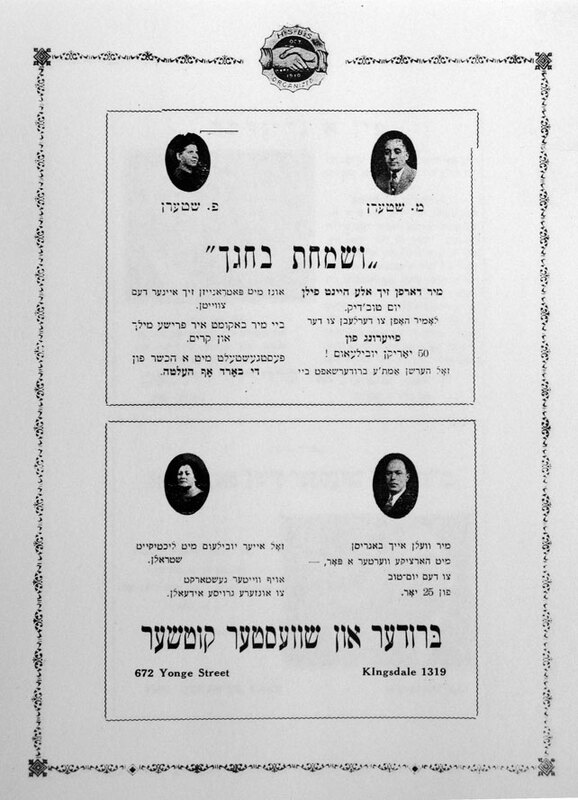 Most of the pages are in Yiddish. 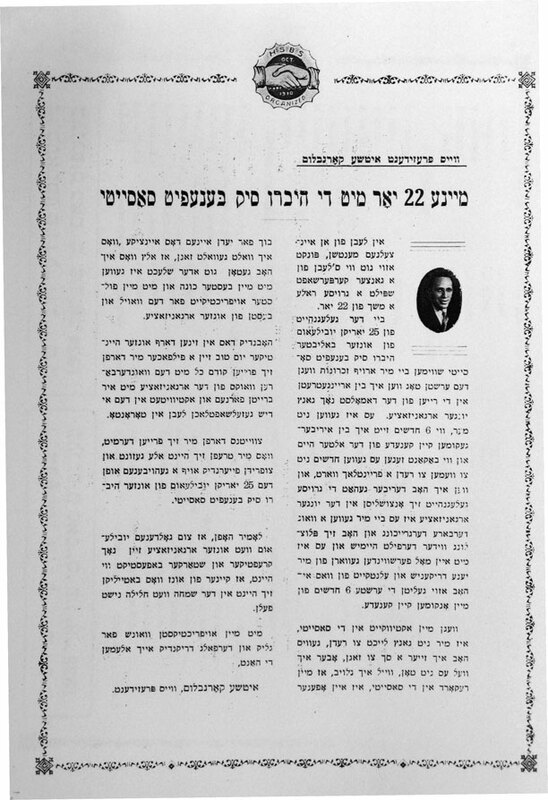 Each page is an expandable JPG; just click on it to enlarge it. 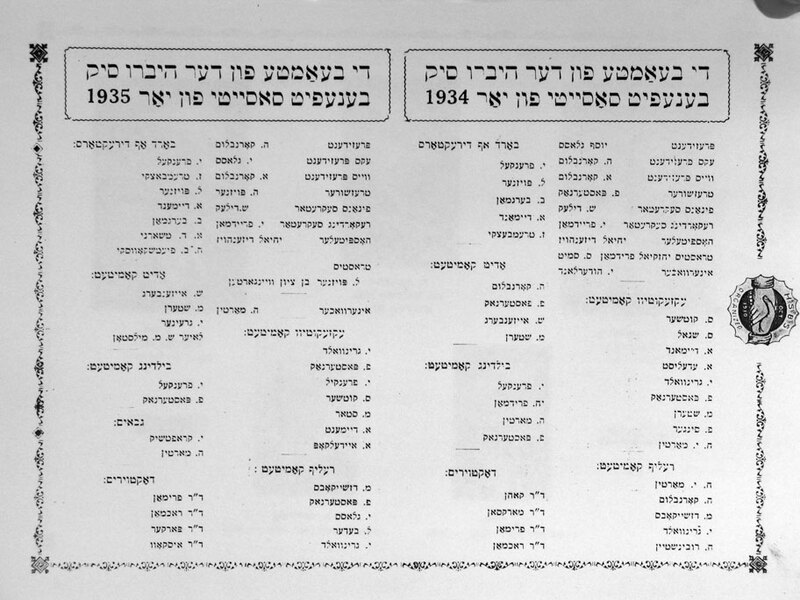 Names on each page are listed in the file-name of each file; and also repeated as text below so as to come up in a search using this website’s search box. 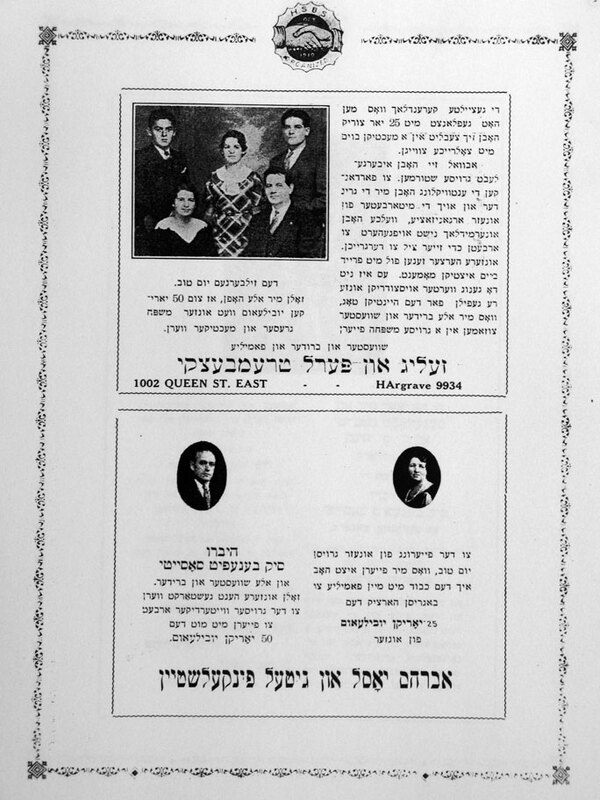 Note that not all pages of the booklet are here — only those with family photos or information have been included. 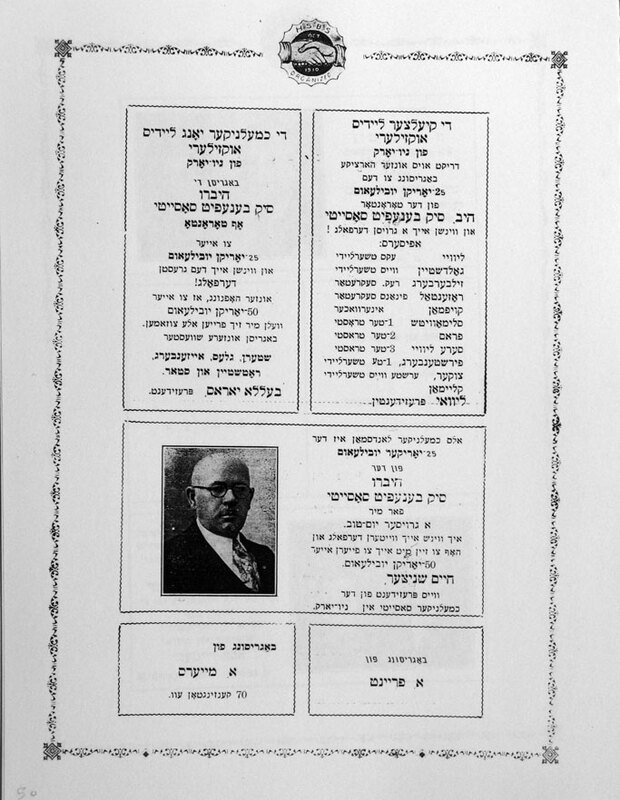 1 various; 2 various; 3 Kornblum; 4 various; 5 Kornblut Kornblum Dilik Glass; 6 Snoll; 7 Depoe Risenman Grossberg; 8 Kornblum Jacobs; 9 Friedman Glass; 10 Kutcher Stern; 11 Dilek Dillek Pasternak; 12 Trembelsky Finkelstein; 13 Rosenzweig Kaufman Kahn; 14 Kielcer Goldblum Goldbloom; 15 Frenkel Frankel; 16 Kiptsi Kipski Ladovsky Ladowsky; 17 Rotstein Starr; 18 Poizner; 19 Kaufman Merkes Fleishman Nisenbaum Meyers Yedvebny; 20 Palestine Kosher Versht Sausages; 21 Midanik Madanik Smith; 22 Weisbrod Zernitsky Bukspon Cherney; 23 Bergman Gorlitsky Disenhaus Mendlewich; 24 Goldstein Rosenzweig Engel Preszenze; 25 Sherman Finkelstein Banach; 26 Shnitzer various.